Ketchikan, Alaska - Edward Morrissey, an experienced newsman who'd worked on the Fairbanks News-Miner and the Seattle Post-Intelligencer, came to Ketchikan in 1919 and started the Ketchikan Alaska Chronicle. From the beginning Morrissey took a strong stand on issues, stirred up controversy and created enemies. My grandfather could not stand Morrissey or the Chronicle or the paper's chief supporter, J. R. Heckman & Company-which was Grandpa Hanson's biggest competitor in the mercantile business. But back to Ed Morrissey; this story is about him. 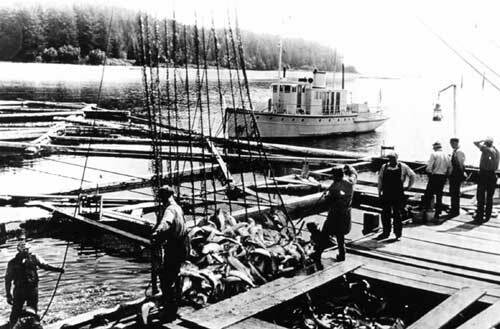 In 1926 Morrissey published a special "Fisheries Edition"
that touted salmon canneries, packing companies and fish traps. In the first issue of the Chronicle Morrissey laid out his platform, claiming to be "independent," not favoring one political party or another and supporting "a square deal for both labor and capital." As the 1920s progressed though Morrissey began taking the side of big business, specifically the canned salmon industry. Morrissey claimed that the industry had been "badly hampered" during World War I, when the government put all its resources into the war effort. Now it was time to put the focus at home and develop Alaska's resources "by giving proper encouragement to the men in power to furnish the means" and to support those "who by their work and thrift have accumulated means greater than the majority of us." Morrissey also promoted mining, logging and other industry to such an extent the Ketchikan Daily News labeled him "the local organ of the would-be Mighties." On the other hand Morrissey railed against another industry: illegal gambling and bootlegging. He stated that more than 20 gambling and bootlegging joints operated around Ketchikan (in the 1920s) and nothing was being done to stop them. He encouraged town folk to rise up and protest this sinful behavior. This raised the ire of another newspaper, the Ketchikan Times, which criticized Morrissey for his straight-and-narrow stance and accused him of being "a gallant knight bearing aloft his shield of shining civic purity." In 1923 Morrissey supported a movement popular in Southeast at the time: secession from the rest of the territory and division of Alaska into two parts, northern and southern. Morrissey supported another issue that came to be known as the Foster Literacy Bill, which advocated that "no person unable to read the Constitution of the United States and write the English language shall be able to vote." Many people believed the bill was aimed at Alaska Natives and meant to disenfranchise them. Whether or not they agreed with him, many folks (not including my grandfather, of course) liked Morrissey-a friendly, out-going Irishman who went to church, loved a good joke, hated Communism and believed in Ketchikan, Alaska, and the United States of America. When he died (from influenza) in 1931, his funeral was held at Holy Name Catholic Church. So many people attended the service that many had to stand outside on the steps. Many downtown businesses (NOT the Bon Marche) closed down in respect of his memory. Since his wife wanted to have him buried in Seattle, Morrissey reportedly had one last wish. As the S.S. NORTHLAND left Ketchikan with his body aboard he wanted taps to be played. This wish was fulfilled by a group of ex-servicemen who organized a dockside ceremony, complete with taps and a farewell gun salute. The Chronicle was purchased by two of Morrissey's employees, Thomas K. Smith and Roy Anderson, and continued to publish until 1957. Atwood, Evangeline and Lew Williams Jr. Bent Pins to Chains, Xlibris Corporation: 2006. Ketchikan Alaska Chronicle, "Our Platform," Ketchikan, AK: July 19, 1919. Ketchikan Alaska Chronicle, "Last Rites for E.G. Morrissey Held Today," Ketchikan, AK: April 27, 1931. Wrangell Sentinel, "New Paper at Ketchikan," Wrangell, AK: August 7, 1919.